The office is conveniently located in downtown Boston – near the Park Street, Government Center and State Street T Stations. There is parking at the meters on Beacon Street in front of the State House, or in the garage across the street, at One Beacon Street. On the T: Take the Red Line or Green Line to Park Street Station. Walk through the Boston Common towards the gold domed State House. Turn right onto Beacon Street. 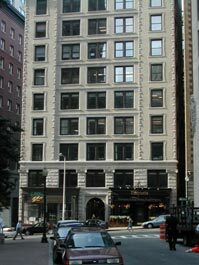 We are one block on the right at 6 Beacon Street, Suite 710, 7th Floor. Or, take the Blue Line to Government Center Station. Walk one block south on Tremont Street. Turn right onto Beacon Street. We are the second building on the left, 6 Beacon Street, Suite 710, 7th Floor. Or, take the Orange Line to State Street Station. After leaving the station, walk up School Street on block. Cross Tremont Street. School Street turns into Beacon Street. We are the second building on the left, 6 Beacon Street, Suite 710, 7th Floor. From the North: Take I-93 South, exit at Storrow Drive. Follow directions for Storrow Drive below. From Storrow Drive: Take the Cambridge Street/Government Center exit, drive up Cambridge Street past Massachusetts General Hospital (on the left) and the Holiday Inn (on the left), the J.F.K. Building (on the left), and Center Plaza (the curved building on the right). Just after Center Plaza, turn right into the parking garage at One Beacon Street, on your right. Go up the elevators, out the door, and across the street to 6 Beacon Street. From the South: From 93 North, take Exit 20 toward I-90/Mass Pike/Logan Airport. Follow the ramps toward I-90/Worcester/South Station. Exit left toward South Station/Chinatown. Turn left onto Kneeland Street. Kneeland Street becomes Stuart Street. Turn right onto Charles Street, pass the Boston Common on the right and the Public Garden on your left. (There is a popular parking lot on your right, called the Boston Common Garage) Turn right onto Beacon Street. Go 0.4 miles up Beacon Hill on Beacon Street. We are number 6. From the West: Take the Massachusetts Turnpike to Storrow Drive (exit on the left). Stay to the right on the off-ramp, and merge into Cambridge Street. Take the right onto Storrow Drive, which is before you go over the Charles River bridge, then follow directions for Storrow Drive above.